The story of KOMFY Pet Products™ began 14 years ago, when Terri adopted kittens Gem and Atticus. Terri named Atticus after her hero "Atticus Finch," the heroic lawyer from "To Kill a Mockingbird" who stood up against small town prejudice. In fact, it was the character of Atticus that convinced Terri to become a lawyer in the first place. Brothers and partners in crime, cats Atticus and Gem played together for well over a decade before Gem passed away suddenly last April. Atticus was joined then by two more adopted brothers to keep him company. One was named Diego, and the other was Ari, the KOMFY Pet Products™ spokeskitten you see playing in all the pictures. Chief Pet Komforter Terri jokes about having an “ark” for rescued and adopted pets, having never said “no” to a cute, furry face in need of a home. KOMFY Pet Products™ sprung from that ark, based off a commitment to keep pets happy and safe, while at the same time making sure their owners don’t have to deal with the hassle of sub-standard pet products. KOMFY Pet Products™ are created with intimate knowledge of kritter behavior, with a focus on pet-healthy materials and low-hassle designs that pets love. Terri’s two dogs Halle (a Maltese) and Buster (a Cairn Terrier) suffered from allergies and were forced to wear a traditional plastic e-collar to keep them from chewing themselves raw. While sitting on the couch one summer night, sandwiched between Halle and Buster's e-collars, Terri looked down at both of her “kids” and said “I wish Momma could make you more komfy.” Suddenly she was struck with an idea: Why not have a komfy fabric cover that fits over the plastic e-collar? The fabric on the inside would be plush against the kritter’s face, but the outside fabric would be durable enough to withstand scratching and wear and tear. Good-bye “cone of shame,” “lampshade” and “satellite dish.” Hello KOMFY Kritter™, which is KOMFY as a Kritter™ and is made in the USA! Making her kids more “komfy” was only the beginning. Terri wanted to give her pets a more humane recovery process, which meant looking at the problems with traditional hard and soft e-collars. For example, traditional hard plastic collars provide no comfort for your pet during its healing process. The plastic strip that keeps the collar together can even bust wide open and fall off completely. Soft e-collars invite your pet to easily crush the collar so it can scratch wounds, rip out stitches, bite itself raw, and constantly lick the affected areas, all of which require another trip to the vet. When it gets dirty, simply remove the solid plastic insert and toss the KOMFY Kritter™ in the washing machine. KOMFY Kritter™ is made in the USA. Those traditional soft e-collars are made in China, and have a strong chemical odor which is difficult if not impossible to eliminate. On a routine trip to one of the major retailer pet stores, we were looking to replace another worn-out catnip toy. We’d been there just a few weeks earlier, and already our little mouse-shaped cloth catnip toy had lost its scent, lost its shape, and our kitten had lost interest. Once it had worn out, what other option was there but to throw it away? Sure, there were a few refillable toys, but they weren’t ideal either. We’d still be stuck with a cloth material that absorbs dirt and unpleasant smells, and that’s assuming they survive the teeth and claws of an excited cat. Add to that how difficult it is to shove loose-leaf catnip into a tiny opening, and we had a recipe for a headache. 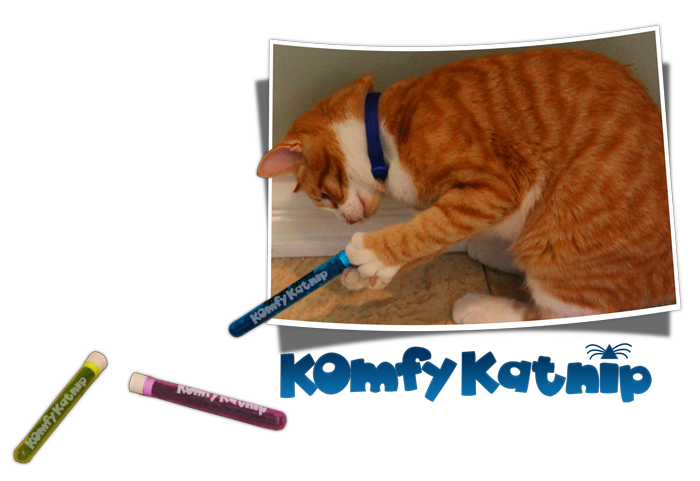 Our cats love KOMFY Katnip™ – they practically helped design it!